Have not been attempted for scheduling purposes (RetryFilter). Are in the requested availability zone (AvailabilityZoneFilter). Can service the request (ComputeFilter). Satisfy the extra specs associated with the instance type (ComputeCapabilitiesFilter). Satisfy any architecture, hypervisor type, or virtual machine mode properties specified on the instance’s image properties (ImagePropertiesFilter). Are on a different host than other instances of a group (if requested) (ServerGroupAntiAffinityFilter). Are in a set of group hosts (if requested) (ServerGroupAffinityFilter). When evacuating instances from a host, the scheduler service honors the target host defined by the administrator on the nova evacuate command. If a target is not defined by the administrator, the scheduler determines the target host. For information about instance evacuation, see Evacuate instances. The filter scheduler (nova.scheduler.filter_scheduler.FilterScheduler) is the default scheduler for scheduling virtual machine instances. It supports filtering and weighting to make informed decisions on where a new instance should be created. The following sections describe the available compute filters. Filters host by CPU core numbers with a per-aggregate cpu_allocation_ratio value. If the per-aggregate value is not found, the value falls back to the global setting. If the host is in more than one aggregate and more than one value is found, the minimum value will be used. For information about how to use this filter, see Host aggregates and availability zones. See also CoreFilter. Note the cpu_allocation_ratio bug 1804125 restriction. Filters host by disk allocation with a per-aggregate disk_allocation_ratio value. If the per-aggregate value is not found, the value falls back to the global setting. If the host is in more than one aggregate and more than one value is found, the minimum value will be used. For information about how to use this filter, see Host aggregates and availability zones. See also DiskFilter. Note the disk_allocation_ratio bug 1804125 restriction. If a host belongs to an aggregate and the aggregate defines one or more metadata that matches an image’s properties, that host is a candidate to boot the image’s instance. # Considers only keys matching the given namespace (string). # Multiple values can be given, as a comma-separated list. # Separator used between the namespace and keys (string). Matches properties defined in extra specs for an instance type against admin-defined properties on a host aggregate. Works with specifications that are scoped with aggregate_instance_extra_specs. Multiple values can be given, as a comma-separated list. For backward compatibility, also works with non-scoped specifications; this action is highly discouraged because it conflicts with ComputeCapabilitiesFilter filter when you enable both filters. For information about how to use this filter, see the Host aggregates and availability zones section. Filters host by disk allocation with a per-aggregate max_io_ops_per_host value. If the per-aggregate value is not found, the value falls back to the global setting. If the host is in more than one aggregate and more than one value is found, the minimum value will be used. For information about how to use this filter, see Host aggregates and availability zones. See also IoOpsFilter. Ensures hosts in tenant-isolated Host aggregates and availability zones will only be available to a specified set of tenants. If a host is in an aggregate that has the filter_tenant_id metadata key, the host can build instances from only that tenant or comma-separated list of tenants. A host can be in different aggregates. If a host does not belong to an aggregate with the metadata key, the host can build instances from all tenants. This does not restrict the tenant from creating servers on hosts outside the tenant-isolated aggregate. For example, consider there are two available hosts for scheduling, HostA and HostB. HostB is in an aggregate isolated to tenant X. A server create request from tenant X will result in either HostA or HostB as candidates during scheduling. A server create request from another tenant Y will result in only HostA being a scheduling candidate since HostA is not part of the tenant-isolated aggregate. There is a known limitation with the number of tenants that can be isolated per aggregate using this filter. This limitation does not exist, however, for the Tenant Isolation with Placement filtering capability added in the 18.0.0 Rocky release. Filters host by number of instances with a per-aggregate max_instances_per_host value. If the per-aggregate value is not found, the value falls back to the global setting. If the host is in more than one aggregate and thus more than one value is found, the minimum value will be used. For information about how to use this filter, see Host aggregates and availability zones. See also NumInstancesFilter. Filters host by RAM allocation of instances with a per-aggregate ram_allocation_ratio value. If the per-aggregate value is not found, the value falls back to the global setting. If the host is in more than one aggregate and thus more than one value is found, the minimum value will be used. For information about how to use this filter, see Host aggregates and availability zones. See also RamFilter. Note the ram_allocation_ratio bug 1804125 restriction. This filter passes hosts if no instance_type key is set or the instance_type aggregate metadata value contains the name of the instance_type requested. The value of the instance_type metadata entry is a string that may contain either a single instance_type name or a comma-separated list of instance_type names, such as m1.nano or m1.nano,m1.small. For information about how to use this filter, see Host aggregates and availability zones. This is a no-op filter. It does not eliminate any of the available hosts. Filters hosts by availability zone. You must enable this filter for the scheduler to respect availability zones in requests. Matches properties defined in extra specs for an instance type against compute capabilities. If an extra specs key contains a colon (:), anything before the colon is treated as a namespace and anything after the colon is treated as the key to be matched. If a namespace is present and is not capabilities, the filter ignores the namespace. For backward compatibility, also treats the extra specs key as the key to be matched if no namespace is present; this action is highly discouraged because it conflicts with AggregateInstanceExtraSpecsFilter filter when you enable both filters. Some virt drivers support reporting CPU traits to the Placement service. With that feature available, you should consider using traits in flavors instead of ComputeCapabilitiesFilter, because traits provide consistent naming for CPU features in some virt drivers and querying traits is efficient. For more detail, please see Support Matrix, Required traits, Forbidden traits and Report CPU features to the Placement service. Also refer to Compute capabilities as traits. Passes all hosts that are operational and enabled. In general, you should always enable this filter. Deprecated since version 19.0.0: CoreFilter is deprecated since the 19.0.0 Stein release. VCPU filtering is performed natively using the Placement service when using the filter_scheduler driver. Furthermore, enabling CoreFilter may incorrectly filter out baremetal nodes which must be scheduled using custom resource classes. Only schedules instances on hosts if sufficient CPU cores are available. If this filter is not set, the scheduler might over-provision a host based on cores. For example, the virtual cores running on an instance may exceed the physical cores. With this setting, if 8 vCPUs are on a node, the scheduler allows instances up to 128 vCPU to be run on that node. The Compute API always returns the actual number of CPU cores available on a compute node regardless of the value of the cpu_allocation_ratio configuration key. As a result changes to the cpu_allocation_ratio are not reflected via the command line clients or the dashboard. Changes to this configuration key are only taken into account internally in the scheduler. Deprecated since version 19.0.0: DiskFilter is deprecated since the 19.0.0 Stein release. DISK_GB filtering is performed natively using the Placement service when using the filter_scheduler driver. Furthermore, enabling DiskFilter may incorrectly filter out baremetal nodes which must be scheduled using custom resource classes. Only schedules instances on hosts if there is sufficient disk space available for root and ephemeral storage. As it can be viewed from the command output above, the amount of the available disk space can be less than the amount of the free disk space. It happens because the disk_available_least property accounts for the virtual size rather than the actual size of images. If you use an image format that is sparse or copy on write so that each virtual instance does not require a 1:1 allocation of a virtual disk to a physical storage, it may be useful to allow the overcommitment of disk space. When disk space is overcommitted, the value of disk_available_least can be negative. Rather than rounding up to 0, the original negative value is reported, as this way a user can see the amount by which they are overcommitting, and the disk weigher can select a host which is less overcommitted than another host. If the value is set to >1, we recommend keeping track of the free disk space, as the value approaching 0 may result in the incorrect functioning of instances using it at the moment. Filters hosts based on properties defined on the instance’s image. It passes hosts that can support the specified image properties contained in the instance. Properties include the architecture, hypervisor type, hypervisor version (for Xen hypervisor type only), and virtual machine mode. describes the machine architecture required by the image. Examples are i686, x86_64, arm, and ppc64. describes the hypervisor required by the image. Examples are xen, qemu, and xenapi. qemu is used for both QEMU and KVM hypervisor types. describes the hypervisor version required by the image. The property is supported for Xen hypervisor type only. It can be used to enable support for multiple hypervisor versions, and to prevent instances with newer Xen tools from being provisioned on an older version of a hypervisor. If available, the property value is compared to the hypervisor version of the compute host. describes the hypervisor application binary interface (ABI) required by the image. Examples are xen for Xen 3.0 paravirtual ABI, hvm for native ABI, uml for User Mode Linux paravirtual ABI, exe for container virt executable ABI. Allows the admin to define a special (isolated) set of images and a special (isolated) set of hosts, such that the isolated images can only run on the isolated hosts, and the isolated hosts can only run isolated images. The flag restrict_isolated_hosts_to_isolated_images can be used to force isolated hosts to only run isolated images. The logic within the filter depends on the restrict_isolated_hosts_to_isolated_images config option, which defaults to True. When True, a volume-backed instance will not be put on an isolated host. When False, a volume-backed instance can go on any host, isolated or not. The IoOpsFilter filters hosts by concurrent I/O operations on it. Hosts with too many concurrent I/O operations will be filtered out. The max_io_ops_per_host option specifies the maximum number of I/O intensive instances allowed to run on a host. A host will be ignored by the scheduler if more than max_io_ops_per_host instances in build, resize, snapshot, migrate, rescue or unshelve task states are running on it. This filter is not enabled by default and not comprehensively tested, and thus could fail to work as expected in non-obvious ways. Furthermore, the filter variables are based on attributes of the HostState class which could change from release to release so usage of this filter is generally not recommended. Consider using other filters such as the ImagePropertiesFilter or traits-based scheduling. Filters hosts based on meters weight_setting. Only hosts with the available meters are passed so that the metrics weigher will not fail due to these hosts. Filters hosts based on the NUMA topology that was specified for the instance through the use of flavor extra_specs in combination with the image properties, as described in detail in the related nova-spec document. Filter will try to match the exact NUMA cells of the instance to those of the host. It will consider the standard over-subscription limits for each host NUMA cell, and provide limits to the compute host accordingly. If instance has no topology defined, it will be considered for any host. If instance has a topology defined, it will be considered only for NUMA capable hosts. Hosts that have more instances running than specified by the max_instances_per_host option are filtered out when this filter is in place. The filter schedules instances on a host if the host has devices that meet the device requests in the extra_specs attribute for the flavor. Deprecated since version 19.0.0: RamFilter is deprecated since the 19.0.0 Stein release. MEMORY_MB filtering is performed natively using the Placement service when using the filter_scheduler driver. Furthermore, enabling RamFilter may incorrectly filter out baremetal nodes which must be scheduled using custom resource classes. Only schedules instances on hosts that have sufficient RAM available. If this filter is not set, the scheduler may over provision a host based on RAM (for example, the RAM allocated by virtual machine instances may exceed the physical RAM). This setting enables 1.5 GB instances to run on any compute node with 1 GB of free RAM. Filters out hosts that have already been attempted for scheduling purposes. If the scheduler selects a host to respond to a service request, and the host fails to respond to the request, this filter prevents the scheduler from retrying that host for the service request. This filter is only useful if the scheduler_max_attempts configuration option is set to a value greater than zero. When resourcing instances, the filter scheduler filters and weights each host in the list of acceptable hosts. Each time the scheduler selects a host, it virtually consumes resources on it, and subsequent selections are adjusted accordingly. 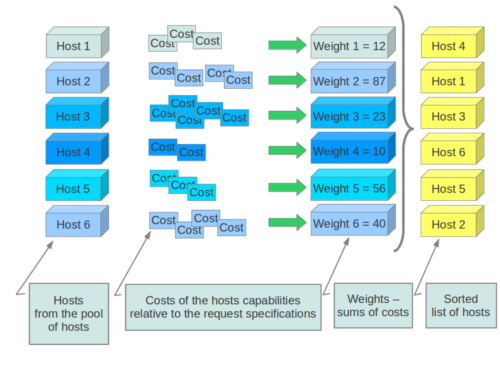 This process is useful when the customer asks for the same large amount of instances, because weight is computed for each requested instance. All weights are normalized before being summed up; the host with the largest weight is given the highest priority. By default, the scheduler spreads instances across all hosts evenly. Set the ram_weight_multiplier option to a negative number if you prefer stacking instead of spreading. Use a floating-point value. If the per aggregate ram_weight_multiplier metadata is set, this multiplier will override the configuration option value. By default, the scheduler spreads instances across all hosts evenly. Set the disk_weight_multiplier option to a negative number if you prefer stacking instead of spreading. Use a floating-point value. If the per aggregate disk_weight_multiplier metadata is set, this multiplier will override the configuration option value. By default, the scheduler spreads instances across all hosts evenly. Set the cpu_weight_multiplier option to a negative number if you prefer stacking instead of spreading. Use a floating-point value. If the per aggregate cpu_weight_multiplier metadata is set, this multiplier will override the configuration option value. New instances are scheduled on a host that is chosen randomly from a subset of the N best hosts. This property defines the subset size from which a host is chosen. A value of 1 chooses the first host returned by the weighting functions. This value must be at least 1. A value less than 1 is ignored, and 1 is used instead. Use an integer value. Defaults to nova.scheduler.weights.all_weighers. Hosts are then weighted and sorted with the largest weight winning. Multiplier used for weighing host I/O operations. A negative value means a preference to choose light workload compute hosts. If the per aggregate io_ops_weight_multiplier metadata is set, this multiplier will override the configuration option value. Multiplier used for weighing hosts for group soft-affinity. Only a positive value is allowed. [filter_scheduler] If the per aggregate soft_affinity_weight_multiplier metadata is set, this multiplier will override the configuration option value. Multiplier used for weighing hosts for group soft-anti-affinity. Only a positive value is allowed. If the per aggregate soft_anti_affinity_weight_multiplier metadata is set, this multiplier will override the configuration option value. Multiplier used for weighing hosts which have recent build failures. A positive value increases the significance of build failures reported by the host recently, making them less likely to be chosen. If the per aggregate build_failure_weight_multiplier metadata is set, this multiplier will override the configuration option value. Multiplier for weighting meters. Use a floating-point value. If the per aggregate metrics_weight_multiplier metadata is set, this multiplier will override the configuration option value. True - Raises an exception. To avoid the raised exception, you should use the scheduler filter MetricFilter to filter out hosts with unavailable meters. False - Treated as a negative factor in the weighting process (uses the weight_of_unavailable option). If required is set to False, and any one of the meters set by weight_setting is unavailable, the weight_of_unavailable value is returned to the scheduler. Host aggregates are a mechanism for partitioning hosts in an OpenStack cloud, or a region of an OpenStack cloud, based on arbitrary characteristics. Examples where an administrator may want to do this include where a group of hosts have additional hardware or performance characteristics. Host aggregates are not explicitly exposed to users. Instead administrators map flavors to host aggregates. Administrators do this by setting metadata on a host aggregate, and matching flavor extra specifications. The scheduler then endeavors to match user requests for instance of the given flavor to a host aggregate with the same key-value pair in its metadata. Compute nodes can be in more than one host aggregate. Weight multipliers can be controlled on a per-aggregate basis by setting the desired xxx_weight_multiplier aggregate metadata. Administrators are able to optionally expose a host aggregate as an availability zone. Availability zones are different from host aggregates in that they are explicitly exposed to the user, and hosts can only be in a single availability zone. Administrators can configure a default availability zone where instances will be scheduled when the user fails to specify one. The nova command-line client supports the following aggregate-related commands. Print a list of all aggregates. Create a new aggregate named <name>, and optionally in availability zone [<availability-zone>] if specified. The command returns the ID of the newly created aggregate. Hosts can be made available to multiple host aggregates. Be careful when adding a host to an additional host aggregate when the host is also in an availability zone. Pay attention when using the nova aggregate-set-metadata and nova aggregate-update commands to avoid user confusion when they boot instances in different availability zones. An error occurs if you cannot add a particular host to an aggregate zone for which it is not intended. Delete an aggregate with its <id> or <name>. Show details of the aggregate with its <id> or <name>. Add host with name <host> to aggregate with its <id> or <name>. Remove the host with name <host> from the aggregate with its <id> or <name>. Add or update metadata (key-value pairs) associated with the aggregate with its <id> or <name>. Update the name and/or availability zone for the aggregate. List all hosts by service. It has been deprecated since microversion 2.43. Use nova hypervisor-list instead. Put/resume host into/from maintenance. It has been deprecated since microversion 2.43. To enable or disable a service, use nova service-enable or nova service-disable instead. One common use case for host aggregates is when you want to support scheduling instances to a subset of compute hosts because they have a specific capability. For example, you may want to allow users to request compute hosts that have SSD drives if they need access to faster disk I/O, or access to compute hosts that have GPU cards to take advantage of GPU-accelerated code. This example configures the Compute service to enable users to request nodes that have solid-state drives (SSDs). You create a fast-io host aggregate in the nova availability zone and you add the ssd=true key-value pair to the aggregate. Then, you add the node1, and node2 compute nodes to it. Use the openstack flavor create command to create the ssd.large flavor called with an ID of 6, 8 GB of RAM, 80 GB root disk, and 4 vCPUs. Once the flavor is created, specify one or more key-value pairs that match the key-value pairs on the host aggregates with scope aggregate_instance_extra_specs. In this case, that is the aggregate_instance_extra_specs:ssd=true key-value pair. Setting a key-value pair on a flavor is done using the openstack flavor set command. Once it is set, you should see the extra_specs property of the ssd.large flavor populated with a key of ssd and a corresponding value of true. Now, when a user requests an instance with the ssd.large flavor, the scheduler only considers hosts with the ssd=true key-value pair. In this example, these are node1 and node2. Aggregates also exist in placement and are not the same thing as host aggregates in nova. These aggregates are defined (purely) as groupings of related resource providers. Since compute nodes in nova are represented in placement as resource providers, they can be added to a placement aggregate as well. For example, get the uuid of the compute node using openstack hypervisor list and add it to an aggregate in placement using openstack resource provider aggregate set. Some scheduling filter operations can be performed by placement for increased speed and efficiency. The nova-api service attempts (as of nova 18.0.0) to automatically mirror the association of a compute host with an aggregate when an administrator adds or removes a host to/from a nova host aggregate. This should alleviate the need to manually create those association records in the placement API using the openstack resource provider aggregate set CLI invocation. In order to use placement to isolate tenants, there must be placement aggregates that match the membership and UUID of nova host aggregates that you want to use for isolation. The same key pattern in aggregate metadata used by the AggregateMultiTenancyIsolation filter controls this function, and is enabled by setting [scheduler]/limit_tenants_to_placement_aggregate=True . Note that the filter_tenant_id metadata key can be optionally suffixed with any string for multiple tenants, such as filter_tenant_id3=$tenantid. In order to use placement to honor availability zone requests, there must be placement aggregates that match the membership and UUID of nova host aggregates that you assign as availability zones. The same key in aggregate metadata used by the AvailabilityZoneFilter filter controls this function, and is enabled by setting [scheduler]/query_placement_for_availability_zone=True . With the above configuration, the AvailabilityZoneFilter filter can be disabled in [filter_scheduler]/enabled_filters while retaining proper behavior (and doing so with the higher performance of placement’s implementation). When using the XenAPI-based hypervisor, the Compute service uses host aggregates to manage XenServer Resource pools, which are used in supporting live migration. Prior to the 19.0.0 Stein release, if left unset, the cpu_allocation_ratio defaults to 16.0, the ram_allocation_ratio defaults to 1.5, and the disk_allocation_ratio defaults to 1.0. The allocation ratio configuration is used both during reporting of compute node resource provider inventory to the placement service and during scheduling. The (deprecated) CoreFilter, DiskFilter and RamFilter filters will use the allocation ratio from the compute node directly when calculating available capacity on a given node during scheduling. The AggregateCoreFilter, AggregateDiskFilter and AggregateRamFilter filters allow overriding per-compute allocation ratios by setting an allocation ratio value using host aggregate metadata. This provides a convenient way to manage a group of compute hosts with similar allocation ratios while leaving the configuration settings alone. Regarding the AggregateCoreFilter, AggregateDiskFilter and AggregateRamFilter, starting in 15.0.0 (Ocata) there is a behavior change where aggregate-based overcommit ratios will no longer be honored during scheduling for the FilterScheduler. Instead, overcommit values must be set on a per-compute-node basis in the Nova configuration files. If you have been relying on per-aggregate overcommit, during your upgrade, you must change to using per-compute-node overcommit ratios in order for your scheduling behavior to stay consistent. Otherwise, you may notice increased NoValidHost scheduling failures as the aggregate-based overcommit is no longer being considered. See bug 1804125 for more details. Since allocation ratios can be set via nova configuration, host aggregate metadata and the placement API, it can be confusing to know which should be used. This really depends on your scenario. A few common scenarios are detailed here. When the deployer wants to always set an override value for a resource on a compute node, the deployer would ensure that the [DEFAULT]/cpu_allocation_ratio, [DEFAULT]/ram_allocation_ratio and [DEFAULT]/disk_allocation_ratio configuration options are set to a non-None value (or greater than 0.0 before the 19.0.0 Stein release). This will make the nova-compute service overwrite any externally-set allocation ratio values set via the placement REST API. Note the bug 1804125 restriction. When the deployer wants to always use the placement API to set allocation ratios, then the deployer should ensure that [DEFAULT]/xxx_allocation_ratio options are all set to None (the default since 19.0.0 Stein, 0.0 before Stein) and then manage the allocation ratios using the placement REST API (or osc-placement command line interface). This scenario is the workaround for bug 1804125. By default cells are enabled for scheduling new instances but they can be disabled (new schedulings to the cell are blocked). This may be useful for users while performing cell maintenance, failures or other interventions. It is to be noted that creating pre-disabled cells and enabling/disabling existing cells should either be followed by a restart or SIGHUP of the nova-scheduler service for the changes to take effect. The nova-manage command-line client supports the cell-disable related commands. To enable or disable a cell, use nova-manage cell_v2 update_cell and to create pre-disabled cells, use nova-manage cell_v2 create_cell. See the Nova Cells v2 man page for details on command usage. Starting with the 19.0.0 Stein release, the nova-compute service will report certain COMPUTE_* traits based on its compute driver capabilities to the placement service. The traits will be associated with the resource provider for that compute service. These traits can be used during scheduling by configuring flavors with Required traits or Forbidden traits. For example, if you have a host aggregate with a set of compute nodes that support multi-attach volumes, you can restrict a flavor to that aggregate by adding the trait:COMPUTE_VOLUME_MULTI_ATTACH=required extra spec to the flavor and then restrict the flavor to the aggregate as normal. There are some rules associated with capability-defined traits. The compute service “owns” these traits and will add/remove them when the nova-compute service starts and when the update_available_resource periodic task runs, with run intervals controlled by config option update_resources_interval. The compute service will not remove any custom traits set on the resource provider externally, such as the CUSTOM_IMAGE_TYPE_RBD trait in the example above. If compute-owned traits are removed from the resource provider externally, for example by running openstack resource provider trait delete <rp_uuid>, the compute service will add its traits again on restart or SIGHUP. If a compute trait is set on the resource provider externally which is not supported by the driver, for example by adding the COMPUTE_VOLUME_EXTEND trait when the driver does not support that capability, the compute service will automatically remove the unsupported trait on restart or SIGHUP. Compute capability traits are standard traits defined in the os-traits library.